Have you been following the Pipeline that is going to be going through the Appalachian Mountain Range as well as Blue Ridge Mountains (I don’t know if they are one in the same, technically). The pipeline isn’t necessary and will totally ruin how the area looks. The pipeline will also run over/under/through the Appalachian Trail. If you haven’t read about it or are unaware, please make yourself aware. If you care about the area at all, it is important to call people and make your voice heard. If you are a Virginian and reading this, then you are well aware and probably sick of all the rain we have received. It has been a lot. 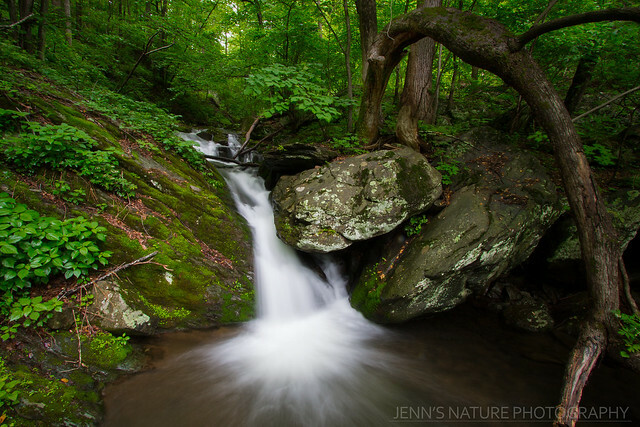 All I kept thinking is, “I need to get to some good waterfalls!” When hiking in Shenandoah it is easy to find a cascade or a waterfall but often there is a trickle of water – especially in the late fall or summer. 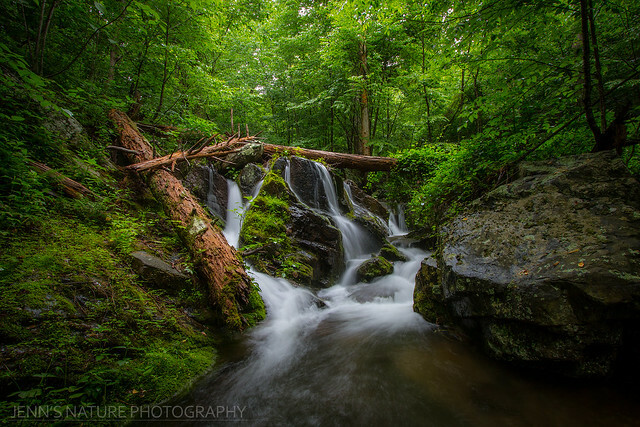 All of this rain was good for those of us who love photographing waterfalls. I decided to return to Doyle’s River Falls. While I enjoyed the photos I took there last year, I yearned for more water and this was my chance. I had originally planned to only hike to the lower falls and return but wondered how Jones Run would look. So I tacked that on to my day since I was alone. As I started down the trail, I was happy. I was alone. The birds were chirping. And it wasn’t long before I heard the water. 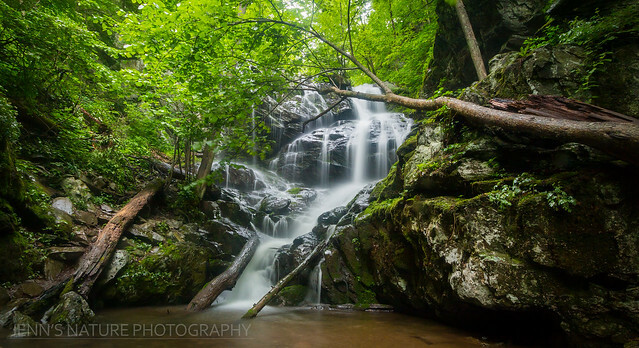 As you go down the trail, you follow the stream down to the falls. I could already tell the amount of water was far more than what I had experienced last year. 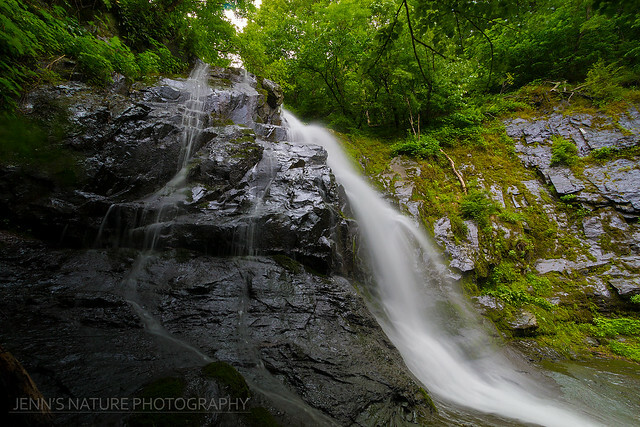 There is a small waterfall before you reach the upper falls. I had the place to myself (a common occurrence on my hike) and could spend time trying new compositions and camera levels. Not every shot was a winner but it was fun trying. The water felt great as well. It wasn’t long before I made it to the upper falls. I sloshed around in the water, sometimes up to almost my knees, trying compositions and ideas. I kept thinking, “I can’t believe I am alone!” It is possible to climb up to the ledge on these falls. I did it last year but since I was alone, I decided to not take a chance. I would have loved to though. Eventually, a family came and their sons removed their shoes and provided to climb everything. It was a blast to watch them. They relished in letting the falls wash over their heads and declared that the water wasn’t that cold. I chatted with the father a bit before proceeding on down the path. It was here where I took my second favorite shot of the day. Maybe my most favorite. I go back and forth. There was just something about the positioning of the logs and how the water ran over the rocks. There is moss and green and it was just beautiful. I enjoyed thinking back to my previous hike and comparing the scenes. As I stood taking this shot, the family passed me by on their way to the lower falls. The lower falls took my breath away. They barely resembled the falls of my memory. Water was everywhere. Again, the boys had climbed up quite high. I wish I could have gotten a shot of them when they were letting the water fall all around them. It looked so cool! They were too speedy for me though. I was waiting patiently so I could have my time. 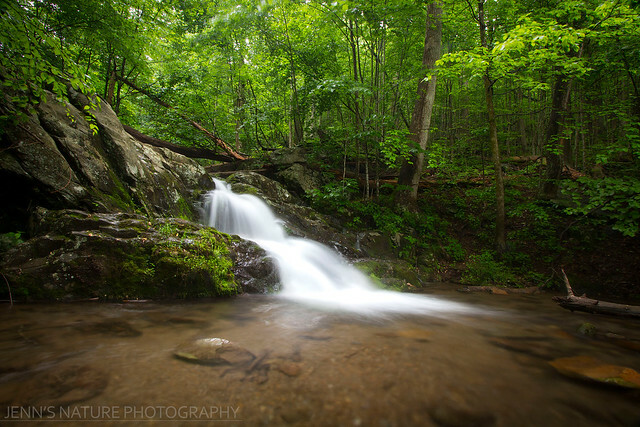 I was careful with where I stepped because where they were waterfalls in Shenandoah, there are snakes. They didn’t spend a lot of time at the falls so once again, I was alone. Photography is something that relaxes me a lot. The moving from place to place. Trying new things. Reviewing shots. Making adjustments. It all takes my mind off of whatever is going on in my life. And then just stopping, looking up, and being one with nature. It soothes me. 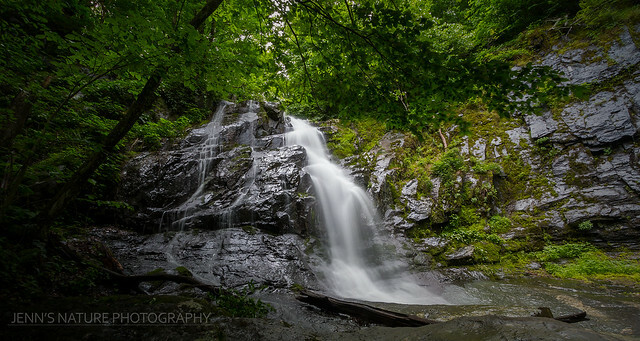 My only complaint about this location was that a tree had fallen over and it blocked out part of the upper portion of the falls. I imagine it probably fell during our big wind storm back in March. All part of the scenery I guess. At this point, I could have turned and gone home satisfied with what I had seen. I decided I would just continue on because why not. I wanted to see what Jones Run looked like with a large amount of water. While Jones Run Falls is not my favorite in the park, the trail is very high on my list. 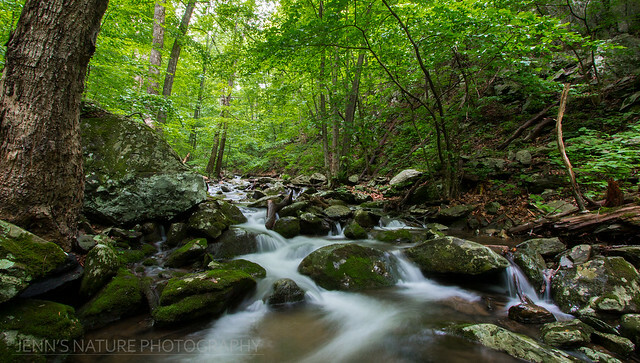 I love hiking along a creek/run/river and this one is just beautiful. There were many places where I wanted to slip down the side of the trail for a photo but knew I had a long ways to hike. Thankfully, some large rocks provided good places for quick photos. 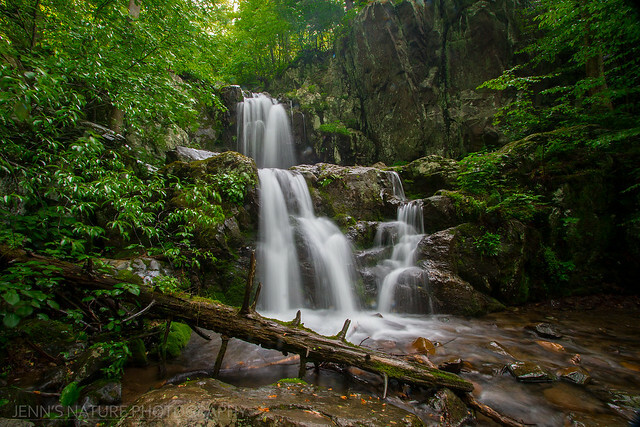 It is a pretty easy hike to reach Jones Run Falls. Hooray! Water! I took some time to eat a snack and took a few photos. It is a great place for a rest as there are a lot of large, flat-ish rocks for sitting. Again, I made sure to look for snakes. Earlier, after walking out of the water, I did almost step on one. I don’t know what kind it was but I certainly didn’t stop and look. I got the heck out of the water. Finally, satisfied with my photos, I took off. I knew the hike back up to the Skyline was steep. Thankfully, my training made the hike much easier than it was previously. My plan was to hitch a ride back to Doyle’s River parking lot. It is about a 3 mile drive but a 3.4 mile hike. I tried. No cars would stop fro me. So I started down Skyline thinking someone would see me and stop. This was actually pretty fun. I was able to see wildflowers that weren’t visible in the woods. No one stopped. 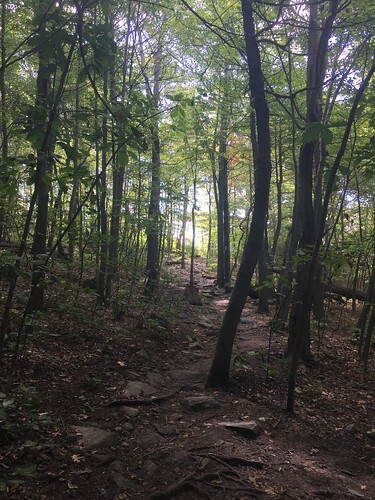 I reached a portion of the trail and saw the white blaze (for the Appalachian Trail) and figured I’d just hoof it the rest of the way on the trail. Well, my mistake…. I didn’t realize it crossed the road. I should have known better since I was on a fire road. I was just excited that it was flat and fast. Soon, I realized I didn’t see any white blazes. I looked at my phone and nope…. I was on some other trail. Can we all say, “UGH!!! !” together? I had to retrace my steps. So once again, when I reached Skyline, I tried to hitch a ride. This normally isn’t a problem but no one would stop. I once again reached the trail and just at that moment, a car slowed. I moved forward and they moved forward. And then they took off. Hope squashed. I sucked it up and eventually made it back to my car. If I had just stopped trying to hitch a ride, I probably would have made it back much earlier. Lame on my part. I was still super happy with my day. 9 miles hiked. Waterfalls galore. Everything was green. My friend, Shari (in white), just below the summit of Mt. Washington. Clearly, she’s having a blast. My friend, Shari, died in December. Our friendship spanned close to 40 years. She battled brain cancer for many years and was always a fighter. The day I saw the news that Shari was in Hospice I couldn’t help but remember the trip we had taken to hike the Appalachian Trail (AT) back in high school. Our church’s youth group, organized by our pastor at the time, decided to hike the AT in the White Mountains of New Hampshire. None of us knew anything about the trail but knew we had better get training. We all gathered used equipment for the trip. None of us had ever been hiking before and owned nothing. None of our families could afford much so we begged and borrowed almost everything but hiking boots. I remember stuffing books into a backpack and walking around town a bit. As an athlete I didn’t think I needed to prepare too much. The trip finally arrived and we drove from Michigan to New Hampshire to begin our three-day hike. That first day was brutal. Up, up, up we climbed. We would take breaks near these beautiful, small streams and took a moment to taste the water. Refreshing! Remembering the details can be difficult at times. It has been almost thirty years after all. I do remember what it felt like to reach the top and look down and be blown away at how beautiful it all was. Our group stayed in hostels for two nights before making our way to Mt. Washington. We were unable to reach the summit of Mt. Washington due to the weather that day but we had a blast putting on all the clothes we brought with us just to pass through one portion. Of course, by the time we reached the bottom it was too hot and we had to take them all off again. It was a wonderful introduction to the AT. It would be many years later before I would hike any portion of the AT again. 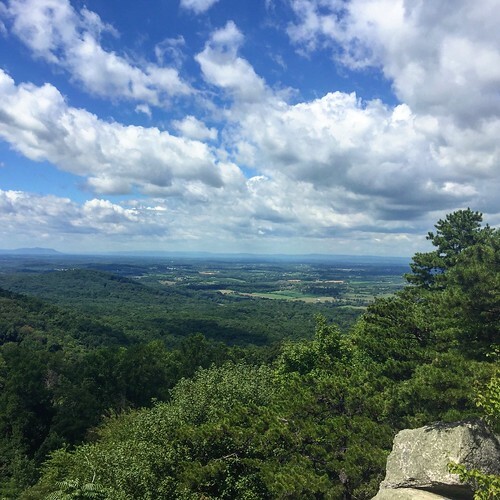 Thankfully I live just fifteen-twenty minutes from the trail and have hiked a few different portions here in Virginia. I’ll never forget the day I was driving my daughter to softball practice and there it was… a sign for the AT. I was so happy and my first thought was back to this trip. 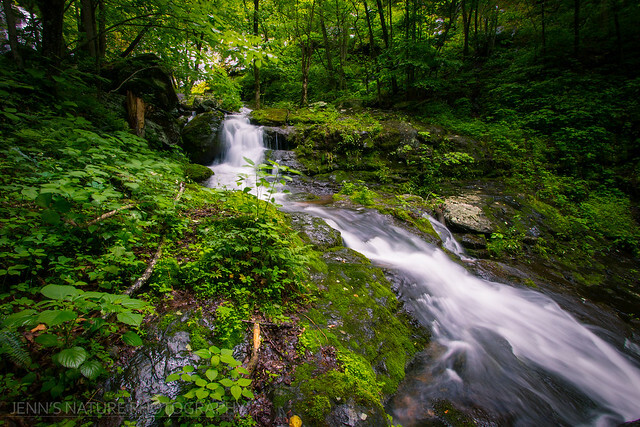 I made plans that day to drive back to Keys Gap and hike whatever I could of the trail. The memory of hiking in the 80s fueled my current passion for hiking. And now, as I take steps across the rocks, see the vistas, and experience the love of hiking I am reminded of how much Shari loved the mountains. A few months ago I shared these photos with her and we had a wonderful time remembering the trip and how much fun we had. She never had the opportunity to hike the trail again. She would comment on my Facebook photos and remark about how she would love to be with me. I wish Shari would have had the opportunity for one more chance to see the mountains and the AT before passing on. But I know that with each step I take she is with me in spirit. Here I am standing at a summit after our first day of hiking. Apparently a Canadian beat me there. After experiencing a very difficult Spartan Super I decided I needed to incorporate far more elevation hiking and running into my workouts. I hadn’t done enough to get through the Super with sort of confidence. 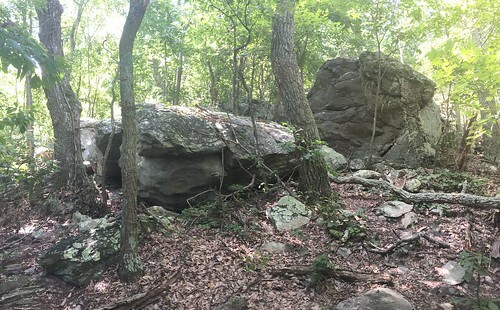 I had read that Raven Rocks had a good amount of elevation gain so I set out this past weekend to hike to the overlook. The start of this particular hike is just 25 mins from my house which was great. I feel very blessed to live so close to the Appalachian Trail. The portion that runs near my house is very rocky. 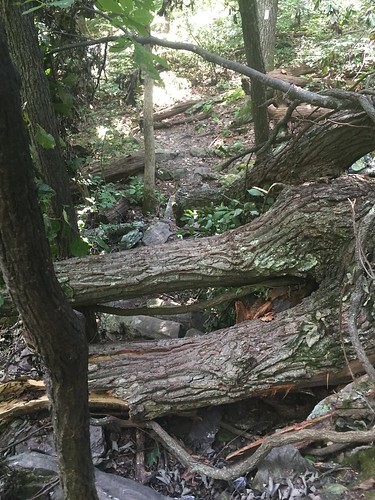 I highly recommend sturdy hiking shoes or boots for this trail (and any portion between this point and Harper’s Ferry). The trail is rarely smooth and even and you will step on, over, around, rock after rock. And in some cases you’ll scurry over trees as well. A group of boys and their leader passed me on the trail and I noticed a couple were wearing tennis shoes and I wondered if their feet hurt. Mine were tired and I was in wearing sturdy hiking shoes (although perhaps a bit too small because my toes hurt bad afterwards). The hike begins by taking you up some steps. It doesn’t last too long before you start heading down quite a ways. I opened my phone and reviewed the trail because I had thought I’d be going up almost the whole time. Nope! The trail is very up and down although there is more going up than down on the way to the Overlook. The GPS reviews I’ve read has the mileage at 2.5 to the Overlook. My phone read 3 miles so just be prepared for something around that length. After you hike about 5-10 mins you’ll finally leave the buzzing of the cars on Route 7 behind you. I spent the next hour with the singing of the cicadas. Sometimes a plane would fly overhead but otherwise it is just you and nature. Although the path is well-hiked, it wasn’t overly busy. I encountered a couple of groups, some through-hikers, and quite a few other solo female hikers. Many have questioned whether women should hike alone. I find that to be a ridiculous query. Yes. Yes we should and do. I have never felt as if I was in danger and have never happened upon any sketchy individuals. Some people aren’t friendly and that is ok but I find that the majority of hikers are happy to say hello or talk about the hike. I met two gentlemen at the Overlook who were preparing to hike the Inca Trail. They shared. I wished them well and off they continued leaving me alone. There aren’t many “views” to behold on this hike. You get one, small glimpse of the valley at about .5 miles in (there is a rock to stand on). And then just trees and rocks for the next 2-2.5 miles. If you aren’t pressed for time you may find a rock or two to climb on or use for a lunch break. There are many. As I continued I kept wondering, “How much longer?” I’m embarrassed to say I was getting tired. The elevation was great for my legs and I attempted to keep pushing along even when breathing hard. I knew I was capable of it. I finally did stop and take a small break to get some water. Alas, I had forgotten the tip to my hydration bladder. I opened it and held it up to force the water out and a bunch spilled on the ground. Ugh! I held the bladder down, placed the tip in my mouth, and then raised it up again. Success! That water tasted amazing because it was hot! I kept checking my phone for mileage. I was at 2.5 and felt like I had a long ways to go. Finally, I saw some sunlight ahead. I always have this memory in my head of driving to a beach in Michigan. It had been a long trip and we were cresting over a hill. I was riding in the top part of our mini-Motorhome and looking out of the window hoping for a view of the water. Eventually the trees parted and we hit the top of the hill and there was the water. In my head, it was a beautiful sight. The view I had reminded me of that. It was beautiful. That light at the end of the trail is the Overlook. And it is a beautiful Overlook. I was so happy to set my backpack down and just take in the beauty of the valley. The two men preparing for the Inca Trail were there but left shortly after I arrived. I had the whole Overlook to myself. I sat there and bathed in the peace and quiet. I looked down and wondered what was below me. I didn’t have to wonder long as I heard a bear cry out a few times. The sun was beating down on me so I didn’t stay too long. 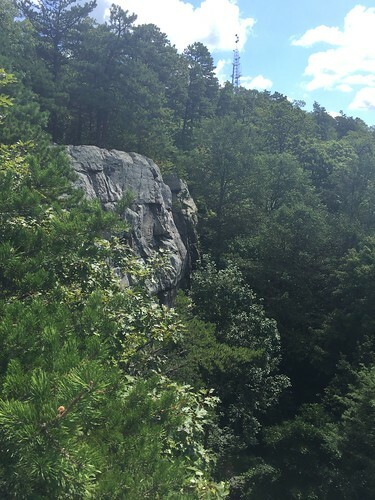 You can see the large rocks that are visible from the Overlook. Apparently this is a very popular rock climbing area in the spring and fall. No one was climbing that day. I would imagine the rocks would have been very hot (plus that bear below). I grabbed my pack, drank a little more water and took off for the return trip to my car. I made good time going back. There were moments of hiking upwards on the way back and I welcomed it. I felt as if I was getting in a good grove and remembered it had just been a week since I had climbed much higher while doing obstacles. I was, however, very happy to get back to my car. I was very thirsty (from wasting so much water) and craved watermelon. My hike took me about three hours. I had no one to chit chat with and didn’t stop for many photos. My goal was to climb the elevation as quickly as I could for a workout. If you decide to do this hike, it may take you up to four hours.